Meet Hobbit, Hercules, Harshit, Hector, Kito and Kidame at Wild Place Project. The six inhabitants are gelada baboons – an all-male group that have arrived from Zurich in Switzerland. You can find the troop in their purpose-built enclosure called Gelada Rocks, in the Edge of Africa exhibit. Although often referred to as gelada baboons, these monkeys are not true baboons, but can be easily recognised by the cape of long hair over the shoulders of the males and the bright red skin on the chest of both sexes which turns a brighter red when the females are in oestrus. It is because of this feature that gelada are sometimes known as bleeding heart baboon. Males grow to around 75cm in length, weighing around 20kg (44lbs), and females to 65cm and up to 16kg (35lbs). They are the last surviving species of a once widespread group of grass-grazing primates. The gelada range in age from six (Kito) to 14 years old (Hobbit). At their previous home they lived in separate families but within the same large troop, and as such are now forming a new hierarchy in their new group at Wild Place Project. 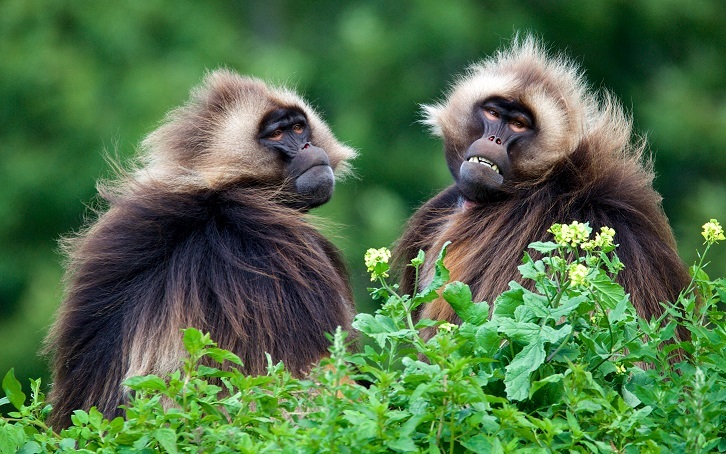 In the wild, geladas live in the mountains of Ethiopia, sleeping at night on ledges on the steep cliff faces. They are protected from the extreme cold of their mountain habitat by the characteristic cape of thick fur. The external paddock area here at Wild Place Project consists of grassland, boulders, rocky outcrops and trees, to provide shade, secluded areas and plenty of grass for the animals to graze. The indoor gelada house is fully insulated and includes central heating. It is able to accommodate more than twice the existing number of animals and has four separate areas enabling keepers to separate the animals when required. Explore behind-the-scenes and get up-close to the gelada by booking a Gelada Rocks experience.